I really don’t mind it being so derivative — the silent, heavy-breathing, POV killer from Halloween, the psycho mom from, well, Psycho, the Carrie finale — but the lack of personality is unbelievable. It promises young dead bodies and delivers exactly that, but with no personality at all. Strip Monopoly, Jason’s mom having her head cut off and Jason coming out of the lake to crush the final girl. Some decent bits lost in a boring slasher. Top badass moment? Whenever I come across people singing around an acoustic guitar, I cringe. Personally I’d have taken the knife from Pam and given her a minigun to deal with them instead. After that we get some guy moping about, channelling the “doomed” thoughts of Private Frazer, whilst “the teens” cheat at Monopoly by ignoring the dice throws, run around in the dark a lot and use a variety of tools badly (check out Alice's hammering). 1 (classic) decapitation, no cats or chainsaws. Movie so famous, that I was sure I must have seen it before. But no, apart from the scenes ripped off multiple times afterwards, this was a pleasant surprise to me. Amateurish, but at the same time honest slasher movie. Fairly gory too (at a price at a dodgy but fun special effects). Visually looks almost artsy, but I suspect it's because director couldn't afford professional filming equipment. Hard to say if the story was original when movie came out, but by now it's like a blueprint. Though the slasher genre was in its relative infancy in 1980, Friday the 13th is inexcusably unimaginative for a film of such lasting notoriety. It borrows heavily from Carpenter's Halloween but does nothing as effectively: Cunningham fails to create any degree of tension or kinship with his characters, and, with the notable exception of Kevin Bacon, the kills are fairly monotonous. 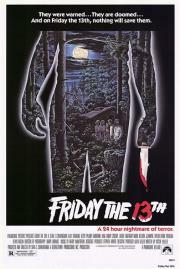 Legendary slasher and an old favorite. A typical horror movie premise is enlivened by a sense of overwhelming tension, violent imagery, and an unpredictable turn of events. Some horror franchises are the story of a relatively strong film followed by cash-in sequels of little, often declining value. But that initial movie retains some quality. HALLOWEEN is an obvious example. This, though - the most well-known, longest-lasting horror franchise in cinema - is an exception; started very bad, stayed very bad. The practical effects are good but not very interesting, and in this context not very effective. The first Sean Cunningham film I have ranked and reviewed here.